In My Garden: Surprise! It's a Lily! Hello friends, so today I was at my brothers house and in his living room he had planted Surprise Lilies in pot's,my brother has a green thumb too, and it made me think about this weird plant that just shows up in one day, sometimes after forgetting you had even planted them--OK maybe that s just me! Surprise lily, spider lily, magic lily, resurrection lily, pink flamingo flower, hurricane lily, naked lily are all names for the same plant. It must hold the title of the most common names for any plant. Most of the common names refer to the plant's split personality. Similar to feuding in-laws(haha) the leaves and flowers refuse to appear together. In spring, long amaryllis-like leaves grow in large clumps. By early summer the leaves have yellowed and withered. In mid-July-August the surprise appears. The fragrant flowers pop out of the ground overnight.Large 2-feet tall naked stems erupt with 6-8 pink blushed funnel shaped flowers. This flower is definitely proud of its long legs. Several species of surprise lilies exist, but most are not reliably winter hardy here in Indiana. The most common one we see popping out of the ground is Lycoris squamigera. Traditional surprise lilies are very easy and durable to grow. Their not picky about soil conditions at all. Surprise lilies flower best in full sun, but do well in partial shade. Bulbs happily multiply, so every five years they can be dug up and separated after they've stopped flowering. The bulb resembles its amaryllis cousin. Bulbs are large at maturity and can grow to about two inches in diameter. When you dig and separate them you may find various sizes of bulbs. Go ahead and plant all of them, but it may take a few years before the small ones flower well. I find surprise lilies a little naked looking when they are grown alone in the lawn. I think they look better in a crowd. 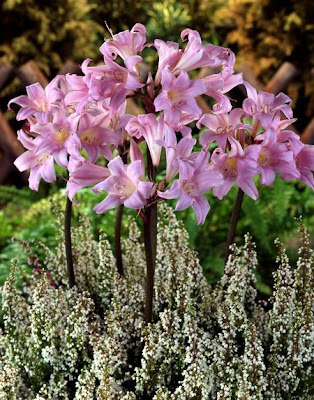 Plant them with Hostas, Ostrich Fern, Daylilies, Iris and just about anywhere you want some two feet tall late summer flowers. 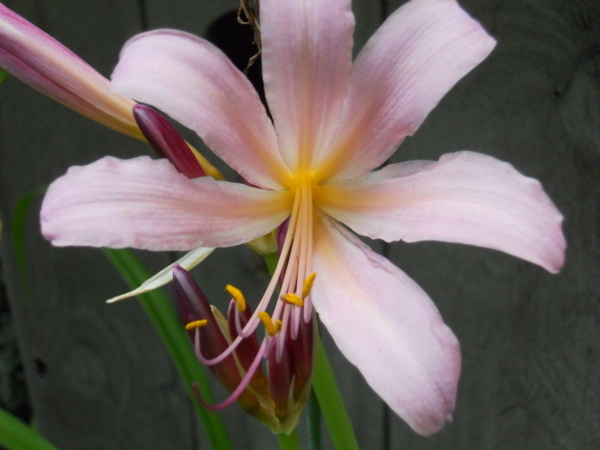 For centuries surprise lilies have been hybridized among different species, so their parentage gets a bit fuzzy. I really like these flowers mostly because if forget about them and then surprise their there! Well I hope you weren't bored and you learned something new. I always wonder if what I say about the plants on here helps anyone. Go a head and get a couple of these plants, even if you grow them in pots you'll really enjoy them. Until we meet again!